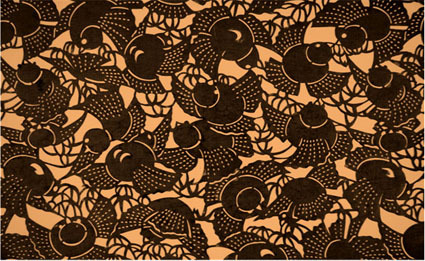 The Museum’s study collection of Japanese paper stencils consists of approximately 5,000 objects that were used in textile production during the Edo period. 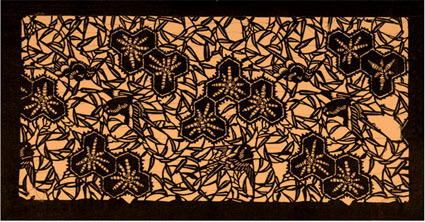 While the majority of such stencils were made for textile production during the 18th and 19th century, some were created to satisfy the demands of Western collectors. The stencils in the Museum’s collection are intricately carved with varied imagery derived from nature, objects of daily life and geometric patterns. 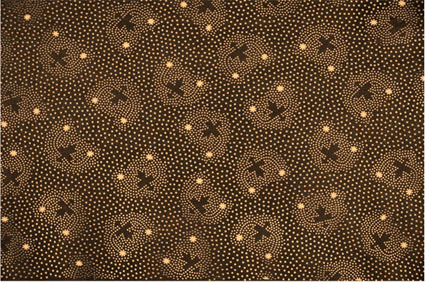 Design elements appear alone or in combination, utilizing such themes as cherry blossoms, toys and chevrons. Due to the complexity of these designs, silk threads were often added to support and stabilize areas of finely carved paper. 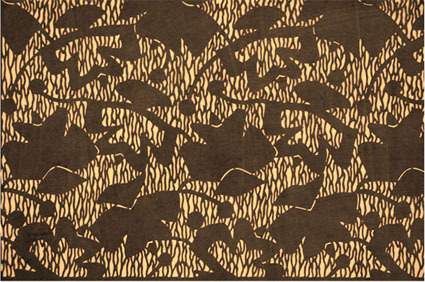 To further strengthen the paper for printing, the stencils were brushed with fermented persimmon juice. 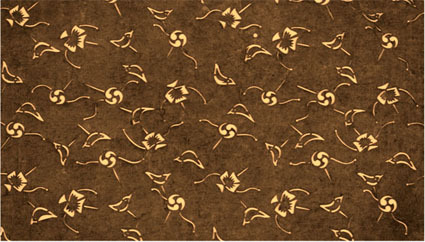 Fermented persimmon juice acts as a waterproofing agent and allows the stencils to be used multiple times during the production of printed cloth. The persimmon juice coating also protected the stencils from insect damage, and as a result, many are in wonderful condition. Until recently, they had been stored in the same manner since 1911, when the majority came into the Museum’s collection. 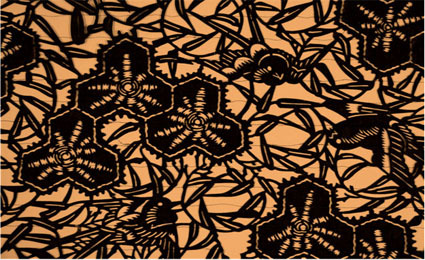 For the most part, stencils with similar design elements were grouped together in document boxes stacked on one another and wrapped in brown paper tied with twine. Only a small group that had been exhibited was housed in archival mats. In 2007, the Conservation and Collection Management department received a generous grant from the Museum Associates to re-house and document approximately 2,000 Japanese stencils. This process began by positioning each stencil into a 4-ply acid-free museum board window mat with archival corners. The newly matted stencil was then placed into archival storage boxes, each containing twenty stencils. Documentation includes assigning unique numbers to each stencil and entering basic object information into the Museum’s collections database. When the project is complete, this study collection will be accessible to the public via the Museum’s online collections database, with each stencil accompanied by new photography. 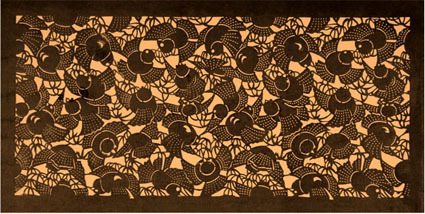 In the meantime, see below for examples (overall and detail) depicting birds in bamboo and traditional Japanese toys. Much like M.C. 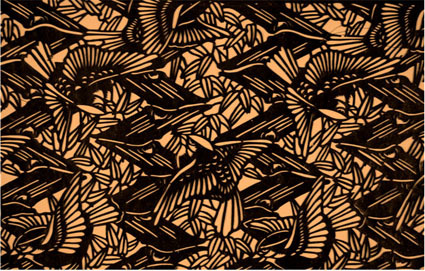 Escher prints, the complexity of the designs requires a degree of visual concentration in order to decipher the represented elements.